What do aardvarks & red wagons have in common? 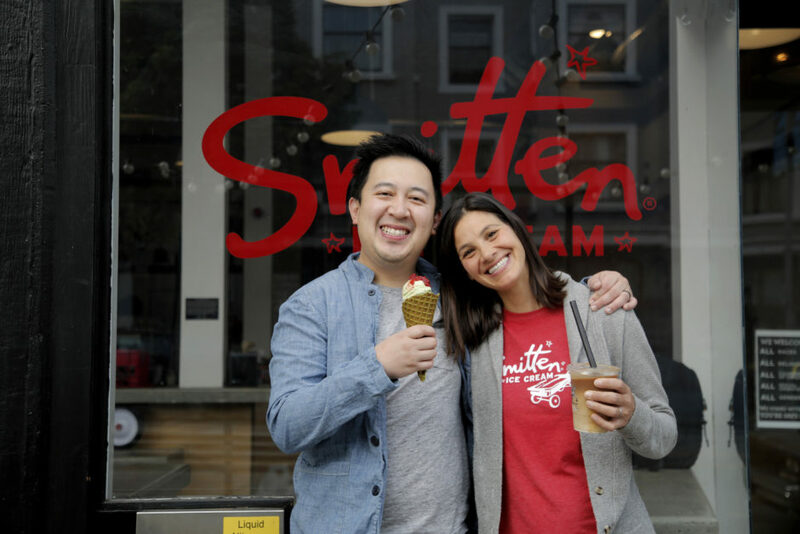 When Robyn and the Smitten team were opening the doors to our first scoop shop in 2011, Andrew & Bin (the duo behind Boba Guys) were just down the road playing ping pong and collaborating on an idea to bring better boba tea to San Francisco. Two years and a whole lotta boba taste testing later, they would open their first brick & mortar on 19th street. These days, their boba is the best in town (as seen by the lines out the door). Our roots are pretty intertwined. Robyn, Andrew and Bin all saw the opportunity to take a well-loved treat and elevate it through transparency and quality ingredients. The three of them collectively said ‘hell no’ to nasty sweeteners and preservatives and ‘heck yeah’ to real fruit and California dairy. Both of our teams work hard to produce pretty much everything in our SF kitchens (yep, even our cookie dough chunks and their grass jelly). 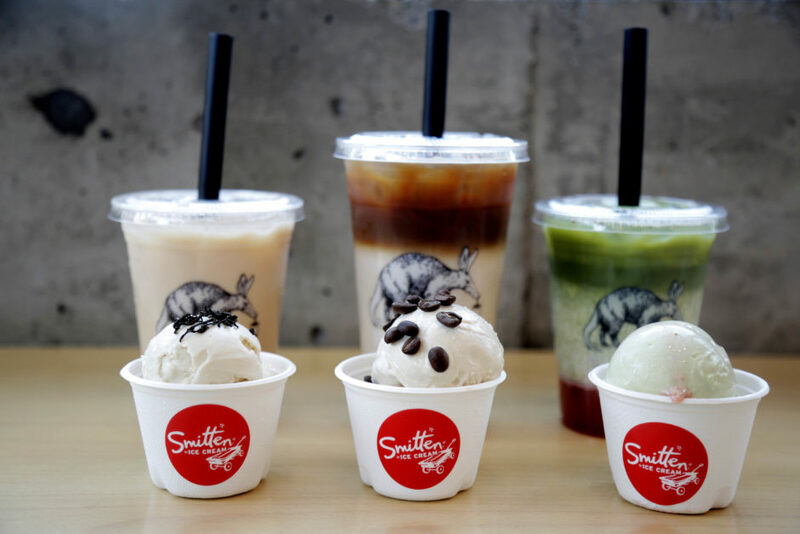 Smitten and Boba Guys have grown alongside each other all these years; we’re each sitting pretty at 8 locations. Our team has always been big fans of the Boba Baes (we can never resist the mid-afternoon craving for some Classic Milk Tea). As of recent, we’re neighbors in Hayes Valley, the Mission, and Pac Heights. And now, we’re partnering up for a series of ice creams that bring out the best in both of us. 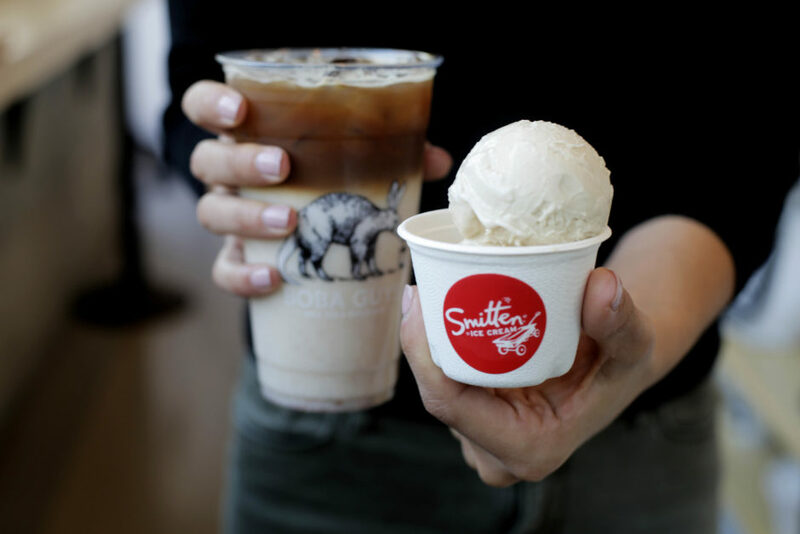 This fall and winter, you’ll find your favorite Boba Guys drinks in ice cream form at Smitten. Yep, you heard that right. We’re kicking off our collaboration series with the ice cream version of Dirty HorchataTM (Boba Guys’ trademarked, secret-menu masterpiece), made with a spice blend from Boba Guys, rice milk and Four Barrel coffee. And we’ve got at least two more flavors in the pipeline. Looking for a sneak peek at our collab? Snag your tickets here to the Boba Guys x Smitten launch party on October 25 at our Mission shop.